We all have those days. If you're a mother, you know the feeling of sensory overload. That "If-one-more-person-touches-me" feeling. Motherhood doesn't end at 6pm. Motherhood is a 24 hour job. It doesn't end on the weekend. There is always another "can I have", always another fight to break up and always another "what's to eat?". The circle of life seems to begin and end with you. Nourish them, nurture them, but don't forget to make sure they learn independence. It's a hard never ending battle that sometimes feels like it robs all of you into it. And as stressful and dirty and messy as it is, we still keep pouring ourselves into these people. We know it is worthy. We know the value that it has. Because behind every little dirt smeared face is a heart that loves us unconditionally and with a strong amount of bias. We are THAT person for them. They just want to touch us one more time. Just want to give us one more hug before bedtime, just want us to serve them a little longer. Just one more glass of water. It's ok to replenish our souls. "You can't pour from an empty glass" - every mother knows that feeling. That feeling of having nothing left to give and we give anyway. But what are they getting from us once all the love is poured out? If you feel the sting of guilt upon pondering that question, you are not alone. It isn't our best. Our children don't need us to be perfect. They need us to be their peace and in order to be their peace, we must pour some peace back into our glass. What do you will your glass with? Meditate or Pray. Spend the first ten minutes of everyday in meditation or prayer. Anxiety is trying to control something that isn't ours to control for too long. Let. It. Go. Take a walk, sit in your garden, bird watch or go for a scenic drive. Breathe in the beauty that surrounds you. Marvel at nature and the beauty in it. Deeply observe something that you didn't create. Take a bath - and LOCK THE DOOR. Lose yourself in a book of your choosing. Not a "how to parent" book - Choose a worthwhile subject and feed your soul! Something you love. Something you've always wanted to learn. Some novel you've been meaning to get to. Preferably while doing number 3. Throw the schedule out the window for just one day. Spend time with your children. Just sit and talk, cuddle and be present with them. Not rushing to the next thing on your schedule. Cancel it all. Create - There is a hobby, a craft, an artistic endeavor that you have been wanting to learn, itching to pursue or already have and your heart secretly pines after having the time to just sit. So... just. sit. down. Forgive someone - dig deep and find something robbing energy from you. Energy that would be better directed in a positive way. Energy that would be better used in your glass as positivity. Let. It. Go. Journal - write it all out. Get the gel pens out, girl. If poetry interests you, then play with words. If you don't finish, who cares? Write a journal entry, a novel, a recipe. Anything. Use words. Spend some time cultivating a passion within your heart. YOUR passion. Not. someone. else's. Music has healing qualities. Whatever music speaks to you - lose yourself in it. Put on headphones -- while you're sitting on the couch, while you do the dishes, turn it up loud while you clean. Serve someone else. Choose one thing you can do this week that helps another person that is not your family. I don't mean feeding the homeless - or maybe I do. It's your heart, not mine. Only do this one if it truly replenishes your soul - really dig deep and make sure it isn't another drain. But sometimes serving someone else doesn't have to mean time or effort. It can mean you checked on another mom who is going through chemo or you offer a shoulder to another mother when you are up -- and she is down. 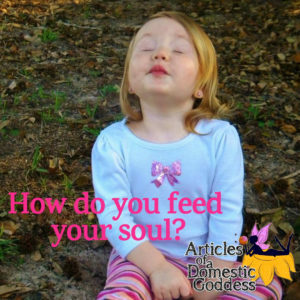 This might be the most important soul-feeder on this list! Build a circle of moms who uplift you - and uplift them back. Go on a picnic or go for ice cream. Mom dates with our kids. No friends. Don't put a picture on Facebook. Just you and your children. Make it a regular thing. The goal is to enjoy time in the sunshine and realize that it's ok for moms to live in the present, not in anticipation for the future or dread for the past. Really enjoy this moment. Right now. Hint - Your children likely already are - It's YOU who is lost in time. Get on their wave-length. Late night star gazing. There is something about looking up at the stars to make us realize how small we truly are - and in comparison, how small our problems truly are. Let. It. Go. Even if it is just 20 minutes. Fitness - Yoga, running, walking, Tai Bo, Zumba - just move and get those endorphins pumping! It's literally God's happy juice. Dream. Spend time with yourself. Ask yourself one question. What do I want to accomplish? I always felt guilty for admitting that I do this, but it is read wrongly sometimes. This doesn't always mean we are thinking for selfish gain - but sometimes it is. It is goal setting. Ask yourself what you want to accomplish today, this week, this month. Have a plan of action. Organize your thoughts. Brain dump. Get a pen and a journal and dump it all into the journal. Then organize it. Then organize it some more. How can you make your dream into a reality? Go to bed. I know that as mothers we are raring at the bit for that 1-2 hours after everyone else goes to bed. It really does further a vicious cycle of going to bed late and waking up tired. Make sure that you're getting enough rest.